A newly published Microsoft patent hints that Xbox One and its new Kinect camera sensor could dole out Gamerscore-like achievements for watching TV and ads. Microsoft's "Awards and achievements across TV Ecosystem" was filed with the United States Patent Office in 2011 as a method for awarding users who watch linear video content. "Traditional television viewing experiences tend to be passive, and do not frequently provide opportunities for a viewer to engage with the programming," notes the patent discovered by Games Industry International. "Additionally, with the proliferation of digital video recording devices, advertisers are finding it increasingly difficult to introduce their advertisements to viewers." Microsoft seems to be suggesting that TiVo and other DVR set-top boxes have made it difficult for advertisers to stop TV watchers from skipping over commercials. Microsoft doesn't mention the recently announced Xbox One once in its nearly 6,000-word filing. However, the concept goes along with the console's promise of broadening achievements. Previously, TechRadar reported that Xbox One achievements will receive some expansion love with Microsoft vaguely calling it "a new generation of achievements." The patent also matches up with the fact that the console's "rocket science-level" camera is advanced enough to capture the user goals explained in the filing. "To increase interactive viewing and encourage a user to watch one or more particular items of video content, awards and achievements may be tied to those items of video content," says the patent. Xbox One is an always-on console to some degree, and the new Kinect is a requirement for it to function. However, users will still be able to turn off the 1080p Kinect, according to Microsoft. Xbox One owners can put the system into modes in which the camera is off and can't see you, the company confirmed to TechRadar last week. 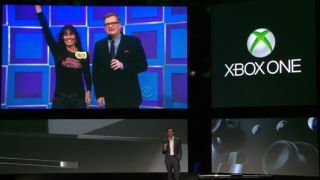 Microsoft reiterated that point, to Kotaku, promising that it is "designing the new Kinect with simple, easy methods to customize privacy settings." So while Xbox One may mirror Bing Rewards for everyday tasks like watching a movie or TV show, Microsoft didn't just patent an Orwellian spy tool. Read up on how Xbox One Kinect may talk back to users, allow for remote play.